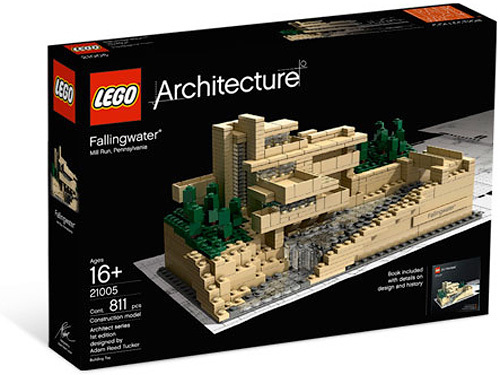 LEGO Architecture: Fallingwater | OhGizmo! Many moons ago we told you how you could virtually explore Frank Lloyd Wright’s Fallingwater house using the Half-Life 2 Source engine, but now you can build your very own miniature replica thanks to the LEGO Architecture series. Designed by Adam Reed Tucker, the model is constructed from 811 bricks, so it’s way too small to give your minifigs a guided tour, but it can be taken apart to reveal the layouts of the different floors, showcasing Wright’s genius. Just be prepared to drop about $100 on this bricktastic work of art. ← Etch A Sketch Freestyle – Wrong! Wrong! Wrong! This looks like super duper fun. Yes, but can I make it into a spaceship? As much as I'd like to play around with this thing, I have more important things to do. A nap comes to mind. This is a great piece to add to any collection. I enjoy building things from legos. My favorite series has to be star wars. The elaborate details are what truly make these pieces great.